Cream jugs have always been collected, admired and used but the type that seems to fascinate more than any other is that in the form of a cow. The name most commonly associated with the production of these charming pieces is John Schuppe. Generally thought to be of Dutch origin there is some evidence to suggest that he might have come from Germany. In any event he arrived in London in about 1750 and registered his mark at the Goldsmiths’ Hall in 1753. Judging by the number of surviving examples these jugs were not only popular in the 18th century but continued to be fashionable amongst the Victorians and Edwardians. It is well known that P.G. Wodehouse weaved a plot around a cow creamer in The Code of The Woosters, published in 1938. The Schuppe creamers are raised from sheet silver and have somewhat comical expressions. The Victorians, however, being fascinated by novelties, produced arguably the finest examples. Firstly, they tended to make them by casting thus adding significantly to the weight and secondly, the finished product was far more realistic. The facial features in particular were accurate not stylized. Schuppe made very little else apart from cow creamers . He died in 1773 so one can only guess at the numbers that might have come from his workshop. Although 100 years later, the Victorian cast creamers are curiously harder to find and it wasn’t until the end of the 19th century that vast numbers started to be imported from Holland and Germany. 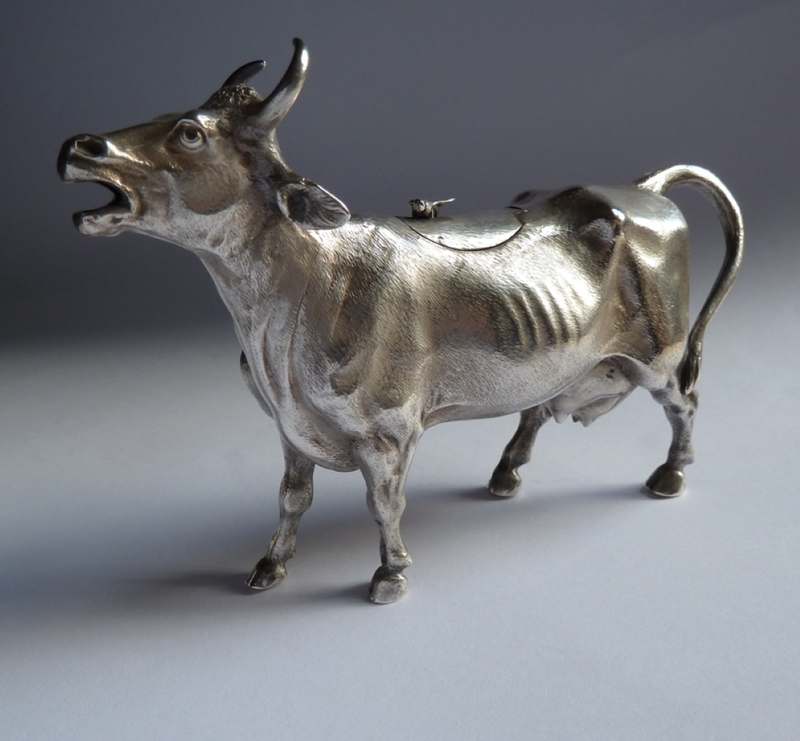 Robert Hennell was one of the more talented silversmiths of the mid-19th century. There were several from this family named Robert and this one is likely to be Robert Hennell IV. He descended from a long line Hennells that began with David (1712-1785) who was a noted maker of salts in the 1730’s and 40’s and the company continued until the 1990's. 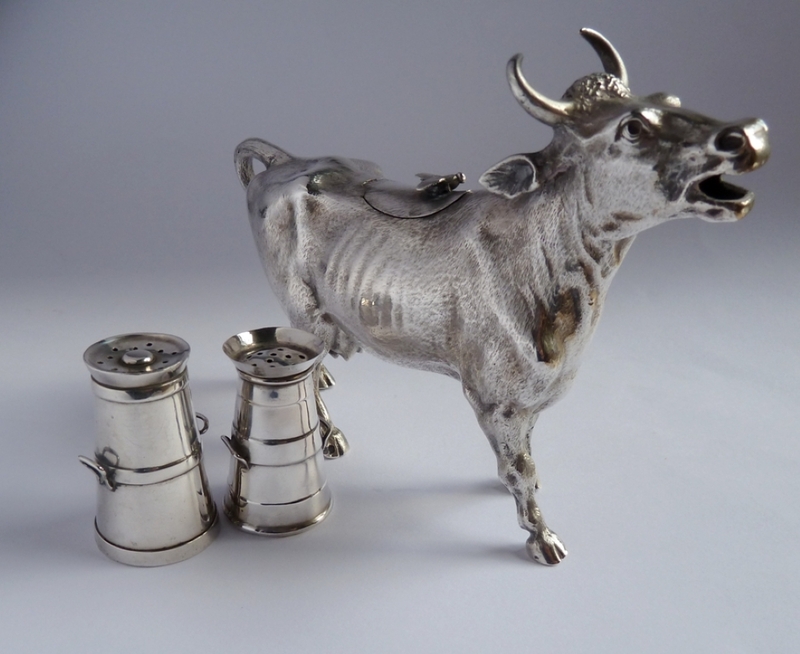 As with this cow he produced a number of finely modelled objects particularly stirrup cups.